Harvey Weinstein‘s chart continues to get analyzed. There’s a non-traditional form of Astrology called Munich Rhythms. It was pioneered by Wolfgang Doebriner. The books are out of print and difficult to understand as they were transcribed from classes in German and then translated word for word in English. There are many chatty moments and run on sentences. Getting thru the book requires patience and fortitude. The premises of Doebriner’s natal interpretation I will cover at another point. However the forecasting technique is very fascinating. It is a wonderful confirmation to Western Astrology. Within any Astrological technique, the more confirmation is visible, the more likely the event is to take place. 12th House (age 1-7), 11th House (age 7-14), 10th House (age 14-21), 9th House (age 21-28), 8th House (age 28-35), 7th House (age 35-42), 6th House (age 42-49), 5th House (age 49-56), 4th House (age 56-63), 3rd House (age 63-70), 2nd House (age 70-77), 1st House (age 77-84). If the person lives past 84 years of age, the cycles re-start going thru the 12th house in 7 year increments. Then one mathematically calculates the precision of when within the specific 7 year period the ruling planet, placement, and aspects it makes will be in effect. In the example of Harvey Weinstein, he is in the 3rd house release as he is currently 65 ½ years old. 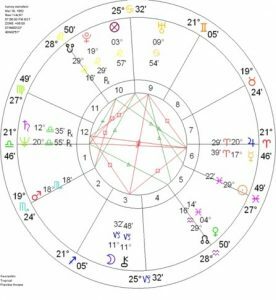 In looking at his rectified chart, natal Moon is triggered. The Moon is often the public, women, nurturance, support, family, and real estate. However the problem is that the opposition to Uranus in the 9th of legal matters will make scandals super magnified. Therefore expect this current scandal to grow. The 2 squares the opposition makes to Saturn in the 12th and Mercury in the 6th will bring about learning lessons and revelations of secrets that can be exposed. Since Mercury involved, there will be a lot of press around this too. In other words, this is going to be a heavy period where there will be a chain of many events. 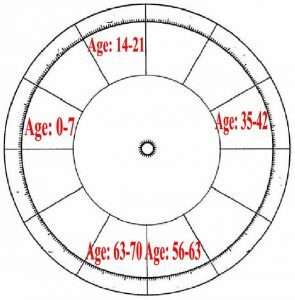 Since this is a rectified chart that was mathematically calculated by using basic astrology, it adds more confirmation to the validity of his birth time being 7:56pm. If the birth time is slightly off, Harvey has to have Libra as his rising sign because of the release of this configuration. In other words, the Moon still has to be in the 3rd house. So this rectified time could have a minus 30-45 minutes of birth. However I’m still going out on a limb and state the time of birth is very close to 7:56pm. Finally, with all the Astrological information we have gathered thus far, the follow periods will have development in legal action. Surely this can go to trial and he does have a strong likelihood to be imprisonment. These periods are: December 3 – December 31, 2017, April 1, 2018-May 15, 2018, and December 2-December 31, 2018.